Four north-east beef producers claimed the top places in the annual McIntosh Donald joint Tesco Scotch steak competition at the Royal Highland Show. First place went to Gray and Noel Gall, Home Farm, Kininmonth, Mintlaw, with a steak from a 300.1kg home-bred Limousin cross heifer, classified U4L. The Gall father and son team were presented with the McIntosh Donald Rosebowl and £1000 cash prize by Jim McLaren, chairman of Quality Meat Scotland. With a diet of grass, silage, pot ale syrup and minerals and McIntosh Donald site director, Alan McNaughton, said it was a clear winner. Second place went to Robert Mann, Bellfield, Kingswells, with a 331.8kg Charolais cross steer (-U3) and a 359.7kg Aberdeen-Angus cross (R4L) from John Troup, Southbank, Skene was placed overall third, also winning the £500 cash prize for the best Aberdeen-Angus carcase. A 335.9kg Beef Shorthorn cross steer (R4L) from Ann Malcolm, Hardhillock, Maryculter, was placed fourth. 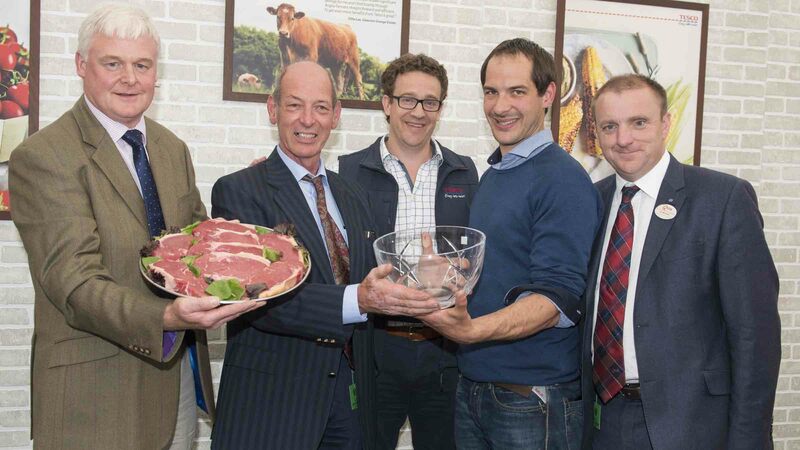 The 12 steaks selected for grilling and tasting for the final of the competition were from the sirloins of 12 carcases selected from an entry of 150 cattle at McIntosh Donald’s Portlethen meat plant at the end of May. But he appealed to producers to meet the carcase spec demanded by meat processors, particularly in relation to weight, to maximise their returns from the market place and meet the requirements of customers. Barney Kay, Tesco agricultural manager said Tesco was back on course after a ‘challenging’ 18 months with profitably restored in the last quarter, as reported last week.